Some of you might have been waiting for this. At least those of you planning to come to Islay in April for the walking week. The WalkIslay website hasn't been updated as of writing this, but earlier today I've received the programme for this year. After seven years of the Islay Walking Week taking place annually I was wondering if they can still find new walks. The answer? Yes, they can. And they sound fantastic! As is tradition now the week starts on Saturday with Donald James MacPhee's, who will take us on a circular walk in the Bowmore/Bridgend area. Part of it will be along the shore between the Gaelic College and Bridgend, other stops include Mulindry and Tallant (which has a historic connection with Laphroaig distillery). On Sunday I'll probably join Paul Graham and Paul Capper on their walk from Portnahaven to the Wave Power Station and on to Lossit Bay. The alternative is a walk with Iain McPherson from Killinallan gate to Gortantaoid, a wonderful walk I've done several times already. On Monday Florrie and Maggie will lead a walk from Laggan Bridge along the River Laggan to Laggan Point and then along the Big Strand to Kintra Farm. Sounds like a very nice walk, which made the choice difficult, but I will probably go on the walk with Jack and Rae Adamson. They will take us from Kilchoman up to Creag Mhor and the trig point. Via Gleann Osamail and Rockside we return to Kilchoman. Islay Visitors Welcome Evening in the evening. Tuesday sees Scott Brown and Alan MacDonald take 16 walkers on the famous Bholsa and Rhuvaal walk. Having done the walk twice already I'll probably give others the opportunity and instead make my way south for some Walking and Birdwatching on The Oa. Wednesday is Colonsay day, or better Oronsay day. It's something we had hoped to do for a number of years, it looks like this year the moon, stars, sun and tides align for the walk across The Strand to Oronsay and to the Priory. James How from the RSPB leads this walk. Friday it's all over. Well, once the walks are done. 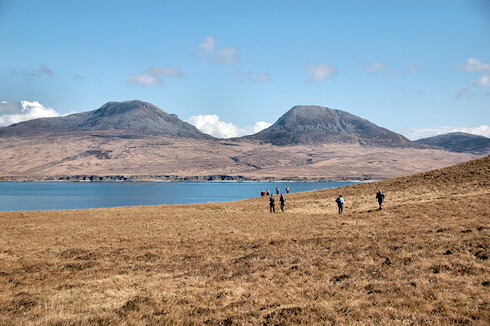 Gordon and Louise Muir will lead a walk on Jura around the Gatehouse/Lagg area, good views to Gigha and Arran are promised (weather permitting). The two Pauls have the honour of the last walk in the Ballygrant area before it's soup and sandwiches at Ballygrant Hall.